While Monumental is traditionally the realm of the markers and monuments and memorials left throughout the city, Council Chairman Graham said something at this morning’s re-opening of Eastern Market that stuck with me. 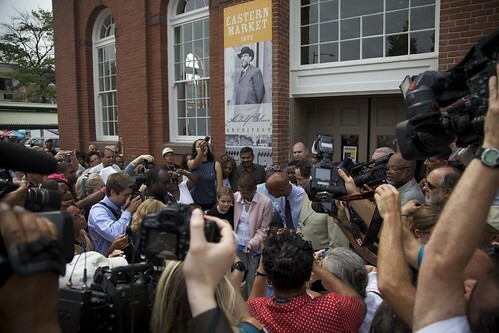 He said that Eastern Market was DC’s own Monument, more so than any of the Washington monuments. He couldn’t be more right. Let’s take a look at our rededicated monument to city life. Eastern Market was constructed in 1873, designed by Adolf Cluss. 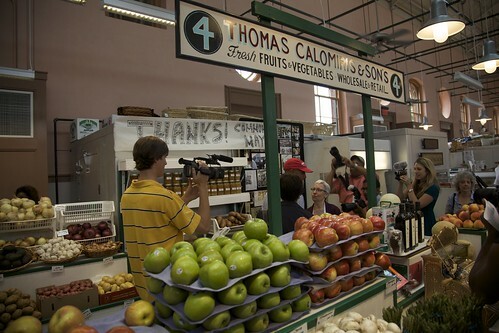 The District was attempting to urbanize and part of that plan was a series of local markets for produce and meat. Cluss designed Central and Eastern markets as part of the new system. As the Post would point out in the wake of the fire, Eastern Market is truly local. The architecture of the space, done in the Italian style, in old red brick, is set at odds with the Federal style of granite, marble and columns. Eastern Market has ebbed and flowed, growing in 1908 with the addition of the North and Central halls, and then collapsing again in 1929 to just the South Hall. As the automobile revolution exploded, the market system was less and less necessary as the supermarket world began to take shape. After World War II, the city dissolved the common market networks, and all were demolished with the exception of Eastern Market, which was taken over by Charles Glasgow, Sr., who formed a corporation to run the market’s Central and South halls. Eastern Market remains a working market, an integral part of our community and life, nourishing us with fresh produce, bread and pasta, specialty meats and most especially, community. That was the common element today on the faces of all who walked through the revitalized market: the restoration of the heart of their community. Eastern Market is a large part of Capitol Hill’s character, and a gathering place for the community. This weekend’s festivities kick off tomorrow morning at 10am, when 7th Street will be closed off to car traffic, to make the area around Eastern Market a pedestrian plaza. All of the 2007 vendors are back, and everyone was excited to see the crowd today, as most are family shops. It was fantastic to see all the smiles today for our own city monument. Congratulations, Eastern Market. Welcome back.